Police are looking for a man who rode an off-road bike "dangerously" with a child sat on the fuel tank, without a helmet. A witness said the balaclava-clad rider was speeding and pulling wheelies with the youngster on board. The rider, and another in a helmet, were caught on CCTV in Littleton Road, Salford, at about 14:20 GMT on Friday. Police received a report that people on off-road bikes were later seen in Frederick Road before 15:00 GMT. 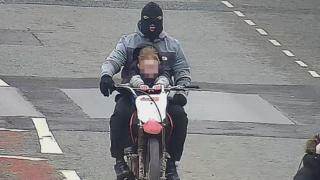 Image caption Police said the actions were "brazen and reckless"
PC Steve Williams, from Greater Manchester Police, said: "Although you can't see the men's faces, I'm hoping someone might recognise the bikes or know who is behind the mask. "Their actions were brazen and reckless, not only putting themselves and other road users in danger but they also put a young child at risk." In 2018, a police chief said that "whilst there is law around on-road bikes, it's too easy to be able to purchase an off-road bike that in itself is a weapon". Assistant Chief Constable Ian Critchley, from Merseyside Police, said "in the main, legislation is appropriate" but suggested "some changes" could be made.